Are you making the best of slurries and manures? Lincolnshire manufacturer Gissing was showing its latest slurry tanker at the show. The firm’s first in-house tanker features a separate tank and chassis, which Gissing claims reduces stresses on the tank itself. Tank sizes range from single axle 11,000 litres, to triple-axle 25,000 litres. Steering axles on tandem- and triple-axle models are standard. 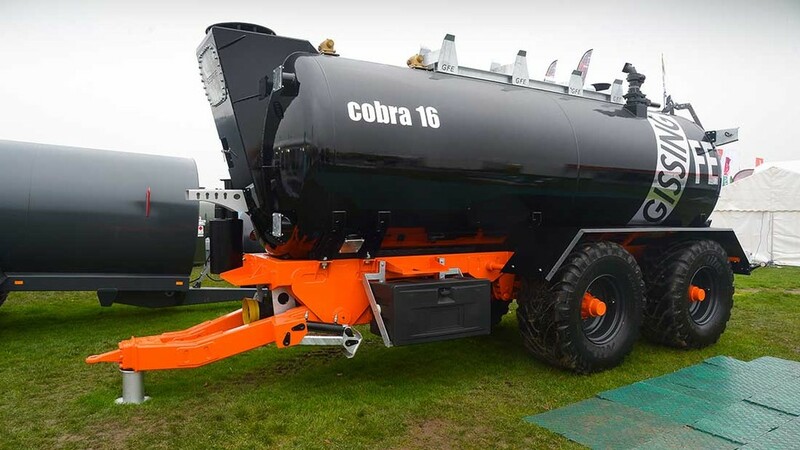 Standard features on the 16,000 litre model on show include 14,000l/min water cooled vacuum pump, LED road and work lights, a three-point applicator linkage and internal pipework to supply slurry from the pump to the applicator. Tanker information is displayed in-cab through IsoBus, with a separate joystick looking after linkage, applicator and, if fitted, filling arm movements. Retail price for a 16,000l model starts from £40,000. 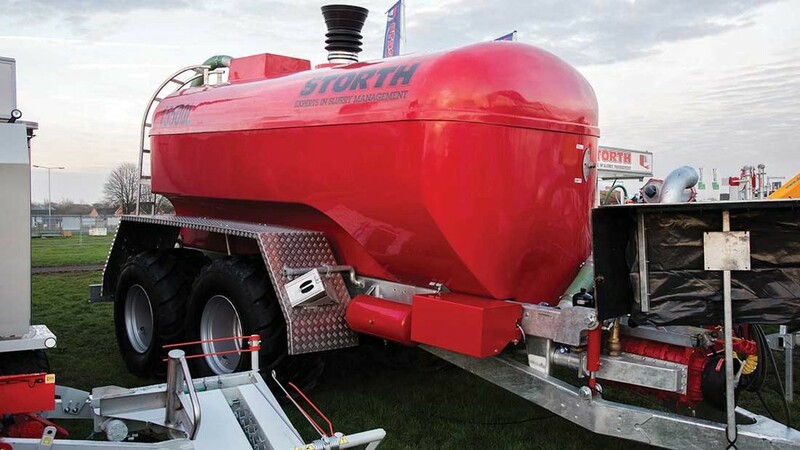 Slurry specialist Storth has designed the Osprey PolyGLAS tanker which uses a plastic tank to offer a weight saving compared steel tanks, giving an increase in capacity of 10 per cent. A Vogelsang self-priming lobe pump with 5000 litres/min capacity fills the 18,000 litre tank in 3 min, and where slurries are likely to contain straw or debris, Storth fits the NovaCutPlus macerator which uses star cutters to process the material through comb fingers and incorporates a stone trap. 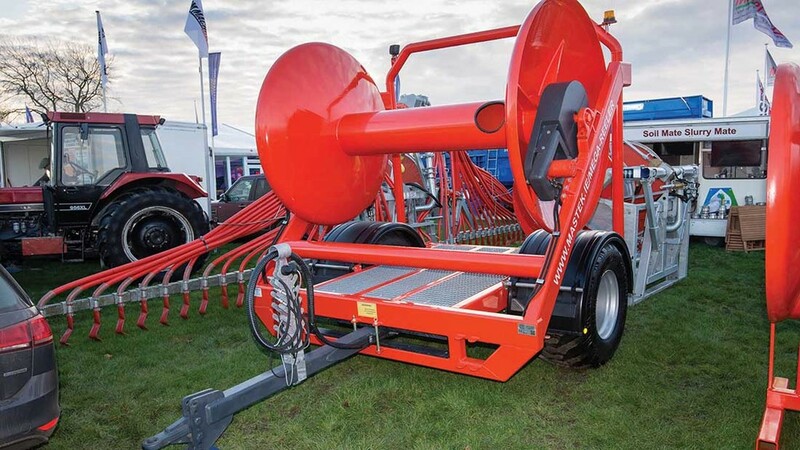 There is a choice of loading positions and application is via a splash plate, giving a 15m spread width; a four-point linkage can be fitted for a Storth 12m dribble bar or 15m trailing shoe applicator. The efficient pump and extra capacity could prove popular with contractors applying AD digestate. Agrifac has supplied a trailed Zunhammer tanker to contractor FGS Services for the application of digestate, part of a range that goes up to 30,000 litres and can be fitted with dribble booms up to 36m and a choice of pumps. The fiberglass tank reduces weight, allowing higher payloads to be carried. Booms can be fixed or fitted to a linkage for easy removal, allowing the tanker to be used for transport to a self-propelled applicator. Remote controlled filling from the cab is an option using the Trista docking station transported to site on the front linkage of the tractor. Prices are around £100,000. Expanding on its range of slurry and digestate tankers in the UK and Ireland, Bauer launched its BSA Profiline tankers at the show. Aimed at large scale farmers and contractors, tank sizes range from 10,000-26,000 litres (10-26cu.m). The steel tanks are galvanised before being powder coated to reduce the corrosive effects of slurry and digestates. Options include an on-board tyre inflation system, weight transfer system to the drawbar and load management system to empty the tanker in compartments improving traction, and a category III four-point rear linkage. List price for the 20,000 litre model on display at the show, with tyre inflation system, 750/60 R30.5 tyres, four-point rear linkage and 18m dribble bar is £133,000. Following the launch of its 24m dribble bar, specifically designed for digestate applications, Mastek has developed a hose reeler to match the capacity of its large-scale application equipment. The firm claims the trailed machine is the biggest hose reeler manufactured in Europe, able to handle 2,600m of 5in SnapTite lay-flat hose. Features include twin hydraulic-powered motors for reeling in hose, a hydraulic sliding drawbar which allows the machine to be offset for easy reeling, large 600/50-22.5 tyres and hydraulic brakes. 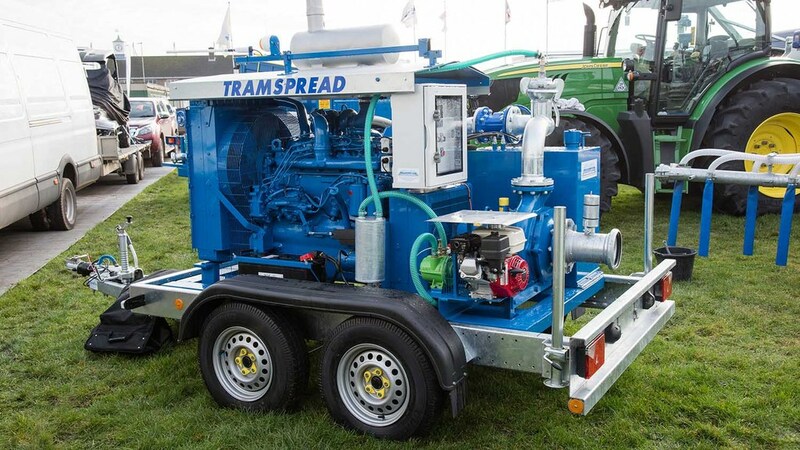 Visitors to Tramspread’s stand were treated to several new products including a powered pump and a mobile nurse bag. The powered pump is mounted on a fully galvanised chassis featuring twin braked high speed axles, allowing the unit to be towed comfortably behind a 4x4. Its Bauer SX2000 slurry pump is powered by a 170hp engine and controlled via the firm’s top-spec SIL Vision IV remote control, only available exclusively through Tramspread. Designed to minimise downtime when spreading far from the slurry store, Tramspread also exhibited the Albers Alligator NurseBag and Reeler. With up to 350cu.m capacities, NurseBag can be reeled out, and using its two standard 6in inlet/outlets can then be filled by tanker while liquid is simultaneously pumped out for spreading. When a block of land has been spread, the Reeler reels the NurseBag onto its spool, expelling any remaining liquid as it goes, which can then be transported to the next site. Multiple NurseBags can be served by one Reeler. Hi-Spec Engineering’s Xcel 1250 spreader is 10 years old this year, and as part of its ongoing development the firm has given it a complete overhaul. Enabling a spread pattern up to 24 metres, spreading disc speed has been increased, compared to 20 metres previously. An adjustment plate has also been incorporated on the shredding rotor hood, which improves spread pattern, as manure is now better placed onto the spreading discs. Other updates include a move to straight body sides and a larger opening towards the rear of the machine, which helps prevent material bridging. Material is now moved rearward by a new single slat marine grade floor chain design, which incorporates floor slats with closer spacing. For greater accuracy, factory fitted weigh cells can also be specified, along with a further option of GPS application mapping. The Xcel 1250 retails at £32,400. 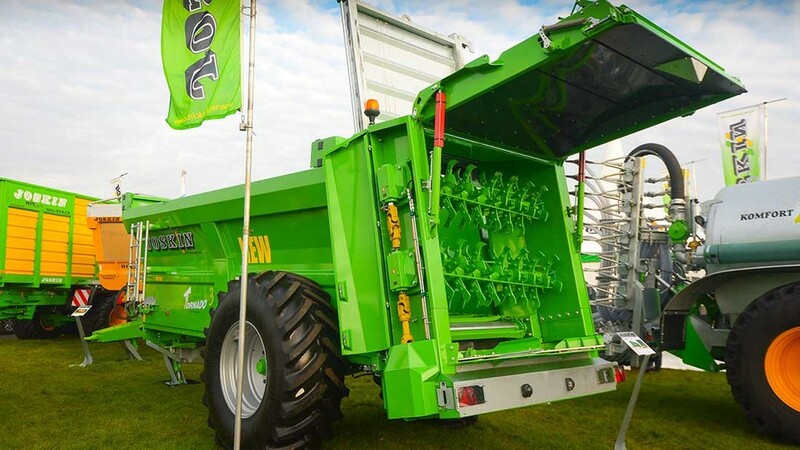 Built for a contractor to spread green waste compost, Agri Hire’s Magnum 40 has a 40-50 tonne capacity, and twin horizontal beaters with 1100mm spinning discs spreading up to 24m. The suspended triple axles can be fitted with front and rear steering and other options include weigh cells to allow variable rate applications. Greedy boards can be added to increase capacity for different loads. 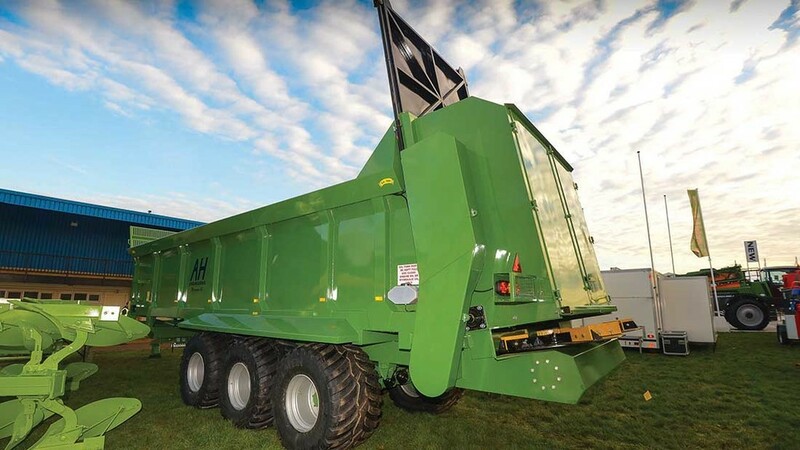 With an unladen weight of 12 tonnes the spreader is also aimed at export markets including Australia, and is priced at £45,000. 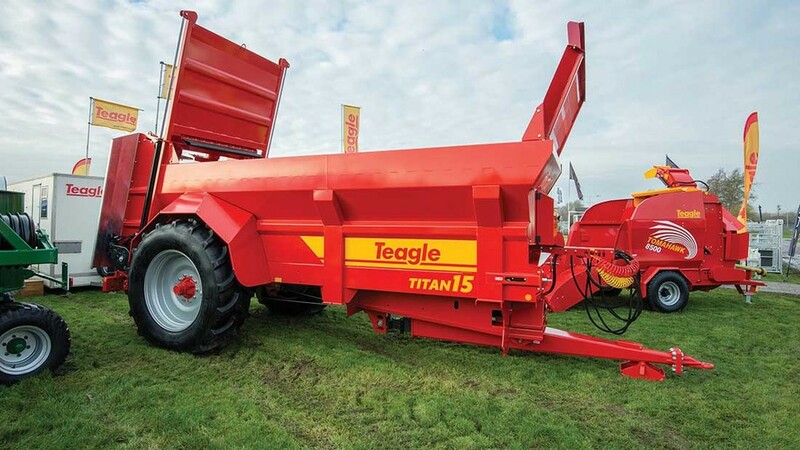 Adding to its five-model range of Titan rear-discharge muck spreaders, Teagle launched two new, larger models. Designed for heavy-duty use, the new Titan 15 and 17 models top off the range offering load capacities up to 20cu.m. The spreader’s running gear gets high speed commercial axles with 406 by 140mm brakes, and a dual air and hydraulic combination braking system as standard, as is LED lighting. Options include electronic bed speed control, weigh cells and variable rate application control via GPS. Available now, the Titan 15 is priced from £35,550. Following on from the development of a horizontal beater and disc spreading unit for its range of larger Fertispace rear discharge muck spreaders, Joskin now offers the optional ‘Horizon’ spreading unit for its range of Tornado 3 spreaders. Initially available on its 14 and 16cu.m models, the unit will eventually be available for the full range of Tornado 3 spreaders. All pto-driven for reduced maintenance, the unit comprises two horizontal beaters and two spinning discs. For flexibility, this can be interchanged with a vertical beater unit. Regulation of muck is via the spreader’s floor and door, which can be done automatically via Joskin’s flow metering system. Further spreading accuracy can be gained for machines fitted with a weighing system, says the firm. Available now, a 14cu.m machine retails from £39,000. 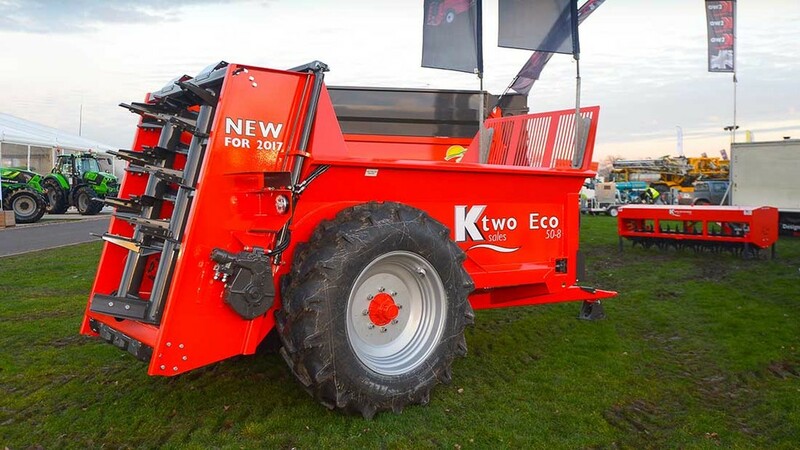 K-Two has gone back to basics for the introduction of its Eco range of rear discharge muck spreaders. Developed for tractors in the 75-100hp bracket, the three-model range offers capacities from five to 7.5 tonnes and is offered as a straightforward twin vertical beater machine. With cost in mind, the entry-level Eco models use twin bed chains and have eight-stud agricultural-spec axles. Prices start at £15,000. A new generation of rear discharge spreaders from Harry West is spearheaded by the 14 cubic metres Maelstrom model. The new Y shaped body gives additional volume while retaining the low 2.45m loading height and a loading access of 2.2m wide. Twin vertical beaters are fitted with specially designed blades spinning at 400rpm to spread a variety of wastes and drive via 14mm chain drives. A wide angle pto is standard and driven through a slip clutch rated at 65 tonnes. Options include a slurry door and weighing system. Production is set to begin this spring, with prices yet to be announced. 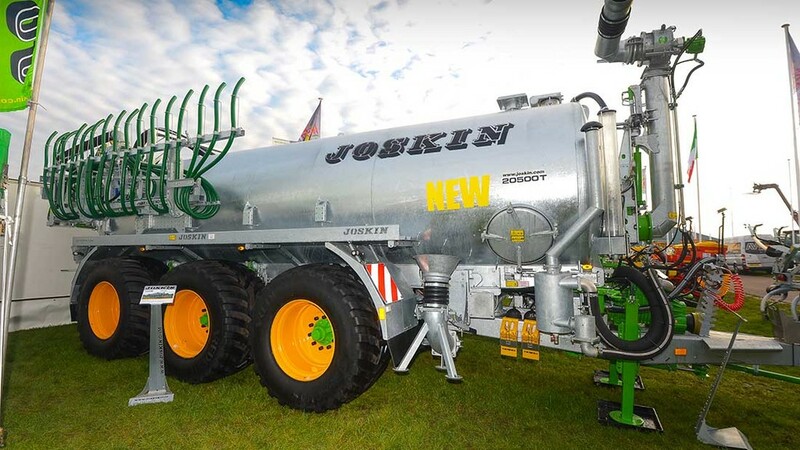 Designed as a heavy-duty slurry tanker for large-scale farmers, Joskin’s latest Volumetra tanker sees the chassis integrated into the tanker, resulting in a lower and simpler machine. The tanker is constructed around a chassis which includes linkage mounting points for dribble bars and injection units, for example. Various positive displacement pumps can be specified including lobe, centrifugal and spiral, or vacuum pump. Tank sizes range from 10,500 to 26,000 litres, which can be fitted with twin or tri axles, depending on model. Axles are bolted to the tanker, which gives the ability to move the axles to where you want them. Richard Western is set to replace its 2000 series muckspreaders with the new 4000 series which features a single floor slat with 20mm drive chains for extra strength and an improved feed to the rotor. Models are from 7.5 to 15 tonnes capacity and feature 890 or 1100mm twin vertical rotors with discs and paddles to spread a range of materials to 18m. Richard Western comments that while horizontal rotors are often chosen for light materials, this combination of vertical beaters and discs gives purchasers the flexibility to handle different manures as required. A 15 tonne 4150 model is priced at £39155.